불교경전은 크게 경(經), 율(律), 논(論)으로 나누어 지는데, 아비담은 부처님의 지혜를 체계적으로 설명하고 있는 논(論)부분을 총칭하여 이르는 말이다. 아비담비바사론은 성불(成佛)하는데 필요한 부처님의 지혜를 체계적으로 모아 중생들이 실천할 것을 설명하고 있는 부분이라고 할 수 있다. 이 책은 고려 현종 때(재위 1011∼1031) 부처님의 힘으로 거란의 침입을 극복하고자 만든 초조대장경 가운데 하나로, 북량(北凉)의 부타발마(浮陀跋摩)와 도태(道泰)가 공동으로 번역한 60권 가운데 권 제16이다. 닥종이에 찍은 목판본으로 종이를 길게 이어 붙여 두루마리처럼 말아서 보관할 수 있도록 되어 있으며, 세로 30㎝, 가로 47.3㎝의 종이를 26장 이어붙인 것이다. 초조대장경은 이후에 만들어진 해인사대장경(재조대장경 또는 고려대장경)과 비교해 볼 때 몇가지 차이점이 있다. 목판의 새김이 정교한 반면에 해인사대장경과 글자수가 다르고 간행연도를 적은 기록은 없으며, 군데군데 피휘(避諱:문장에 선왕의 이름자가 나타나는 경우 공경과 삼가의 뜻으로 글자의 한 획을 생략하거나 뜻이 통하는 다른 글자로 대치하는 것)와 약자(略字)가 나타난다. 또 초조대장경은 책의 장수를 표시하는데 있어서 대체로 ‘장(丈)’자나 ‘폭(幅)’자를 쓰는 데 비해 해인사대장경은 ‘장(張)’자로 통일되어 있다. 이 책도 장수를 표시하는데 있어 ‘장(丈)’자를 쓰고 있는 점, 책 끝에 간행연도를 적은 기록이 없는 점, ‘경(敬)’자의 마지막 획이 생략된 점 등으로 보아 초조대장경 판본임을 알 수 있다. 인쇄상태와 종이의 질 등을 고려해 볼 때 12세기 경에 찍어낸 것으로 추정된다. 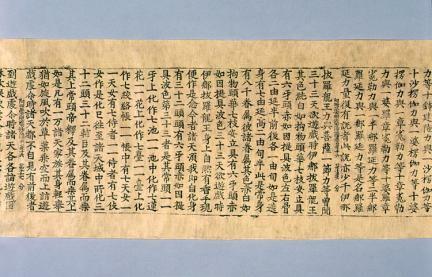 Buddhist texts can be largely divided into three types: gyeong (scripture), yul (law), and non (annotation). The word sastra is used to indicate an “annotation”-type text, which is a commentary written to explain a Buddhist scripture or sutra. In particular, this Abhidharma vibhasa Sastra is a book that systematically describes the wisdom of Buddha for the attainment of Buddhahood. Published as the First Tripitaka Koreana Edition to overcome the invasion of Khitan with the help of Buddha during the reign of King Hyeonjong (r. 1011-1031) of the Goryeo Dynasty, it was translated by Buddhavarman and Daotai of the Northern Liang. 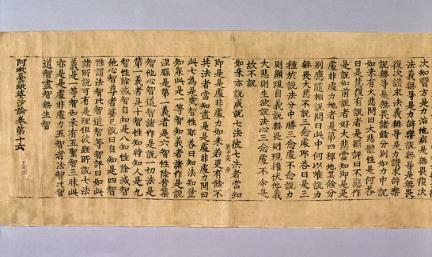 This book was printed on 26 sheets of mulberry paper using woodblocks and was kept as a scroll, measuring 47.3 cm wide and 30 cm long. 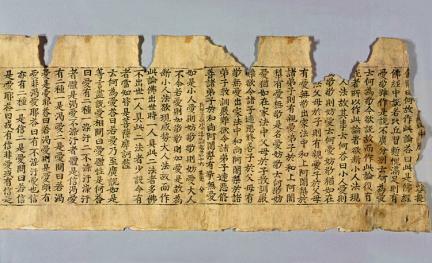 There are several differences between the First Tripitaka Koreana Edition and the Second Edition kept at Haeinsa Temple. While the carving of the woodblocks is elaborate, it is different from the Second Tripitaka Koreana Edition in terms of the number of characters; it also has pihwi (to abbreviate or replace with other letters out of respect for the name of the late king) or abbreviation without a record of the publication period. There is a difference in the indication of number of pages between the two editions as well. This book uses the Chinese character “丈 (jang)” or “幅 (pok)” to indicate the number of pages without a record of the publication period, whereas the second edition uses “張 (jang).” Its publication period is estimated to be the 12th century, judging from its printing state and the quality of paper.